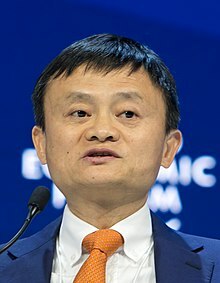 Ma Yun (Chinese: 马云, [mà y̌n]; born 10 September 1964), known professionally as Jack Ma, is a Chinese business magnate, investor, and philanthropist. He is the co-founder and executive chairman of Alibaba Group. As of August 2018, he is one of China's richest men with a net worth of US$38.6 billion, as well as one of the wealthiest people in the world. Ma announced he will retire from Alibaba on 10 September 2018 and focus on educational charity work. ↑ "Jack Ma — born Ma Yun —". Business Insider. Retrieved 2018-03-27. ↑ "Jack Ma". Forbes. Retrieved 2018-03-17. ↑ Tausche, Kayla (10 September 2014). "Alibaba's Jack Ma gets special gift for 50th birthday". CNBC.com. Retrieved 5 January 2016. ↑ "China's richest man Jack Ma to stand down from Alibaba". Margi Murphy. Telegraph. 8 September 2018. Retrieved 8 September 2018. ↑ "Billionaire Jack Ma prepares for life after Alibaba. He'll retire Monday, report says". LULU YILUN CHEN and TOM MACKENZIE. Los Angeles Times. 7 September 2018. Retrieved 8 September 2018. ↑ "Alibaba's Jack Ma, China's richest man, to retire from company he co-founded". The Economic Times. 8 September 2018. Retrieved 8 September 2018. This page was last changed on 13 April 2019, at 22:41.